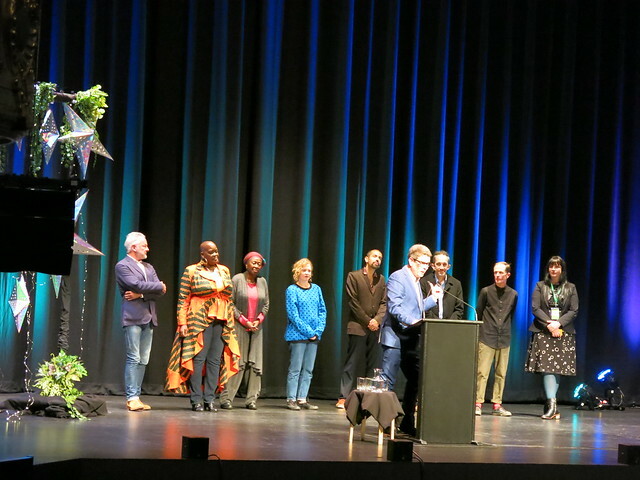 It certainly was a rather star-studded affair on Friday night at the Isaac Theatre Royal for WORD Christchurch's gala event. Everywhere a person turned there were famous faces about; Helen Clark striding past on the footpath out front, Michele A'Court queuing at the bar in the foyer, Georgina Beyer chatting in the row in front of me metres away from Ted Chiang in one direction and Juno Dawson in another. What fine company to be in of an evening. Festival director Rachael King opened proceedings with a valiantly lengthy introduction in te reo Māori (with help, it turned out from Ngāi Tahu Māori language advocate and educator Hana O'Regan). She admitted that the programme she and her team and brought together was "unashamedly feminist" and challenging, exhorting the audience to "see one session a day that scares you"*. From there MC John Campbell took the reins, confessing that he can be a difficult man to pin down, refusing as he does to reply to any kind of communications (phone calls, emails and the like), but that King is "as tenacious and unbowed as the city itself" and hence his appearance at this event. I don't know what John Campbell is like as a gift-giver (if his Christmas presents are rushed affairs or precisely wrapped and carefully considered) but his compliments... his compliments are like finely crafted jewels - cut and polished, thoroughly researched, and presented in a bespoke arrangement you'll never have the like of again. Each writer, in their turn, was the recipient of John Campbell Compliments™ and I can't imagine I'm the only one who felt jealous. The usual pattern for these events is for each of seven writers to take seven minutes to read something or tell a story with the MC making introductions in between. But rather than disturb the flow like a "judderbar" in the evening, Campbell preferred to bring all the writers out in a line-up (like a literary beauty pageant), and introduce (and compliment) them in the beginning, making links and connections between them as he went on. The overriding them between, he thought, was the shared struggle to be human. What I am and what I am not. The question we all ask. First up was Ngāi Tahu storyteller Joseph Hullen who reflected on what it had been like growing up in Christchurch, and how his mother's Ngāi Tahu whakapapa was barely visible in the city, with only a few places like Te Hepara Pai (Church of the Good Shepherd) on Ferry Road or Rehua Marae on Springfield Road that reflected any sense of a Māori presence or identity in the city. But things have changed and his hapu, Ngai Tuahūriri now have Matapopore, a organisation that is adding touches of his people's identity into the fabric of Christchurch. The name of the new central library, Tūranga being a prime example of this, referencing as it does, the arrival place of Paikea the father of Ngāi Tahu's eponymous ancestor, Tahu Pōtiki, and the knowledge he brought with him. Scot, Robin Robertson took the stage next and brought a voice filled with menace and foreboding telling several dark tales in poem form, including one about a cat dying of cancer. His last piece, an invented Scots narrative about selkies, he dedicated to King, the author of Red Rocks, and children's novel about the self-same mythic seal-creatures. Robertson was followed by Yaba Badoe reading the opening chapter of her book A jigsaw of fire and starsopens a new window. In it a baby is set adrift to escape a devastating event, bringing to mind mythic versions of the "floating foundling baby" like that of Moses, Maui, or even Superman. Hollie McNish read some of her poetry and I found my eyes moistening as she spoke of her daughter in poems like "Wow". The power of seeing a new, young person figuring out the world and their place in it conjures up powerful emotions for McNish, and secondhand, for me. Wellingtonian novellist Rajorshi Chakraborti talked about the genesis of his book The man who would not see. It started out as what became "the book that could not be" - a nonfiction tale about the disappearance of his father's sister. After hours and hours of research that led to a re-connection of estranged segments of his family it became apparent that publishing the book would damage that family connection. in the end, he says "the family member in me trumped the writer". And so he repurposed and reshaped his research into a novel instead. Whale-lover Philip Hoare read a couple of extracts from RisingTideFallingStar, stepping out from behind the podium and reading in a most kinetic way, gets his whole body into the reading, acting out certain actions and movements of the protagonist as he went. The language is sensuous and descriptive and you can nearly smell the salt air. 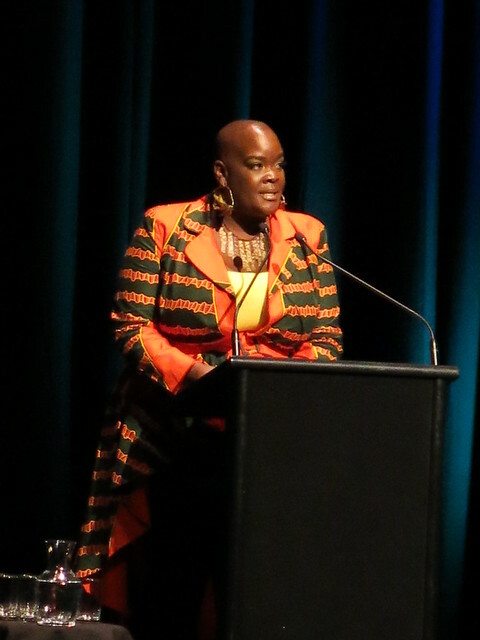 Finally Sonya Renee Taylor explains that there are two kinds of fear, fear of the unknown and fear of the dangerous. We should try not "the fog of the unknown" because there may well be nothing there to harm us. As the free-diver she met in the Bahamas, who dives down into the depths of the unknown, says "every metre is a tiny freedom". Her poem about her mother's belly made me cry again, but her "The body is not an apology" ends the night on a triumphant and defiant note. *So that'll be Robin Robertson in most cases. Terrifying.